This beautiful creature is a Syrphid Fly, also called Hover or Flower Fly. I found her on one of my Gaillardia plants a few weeks ago. 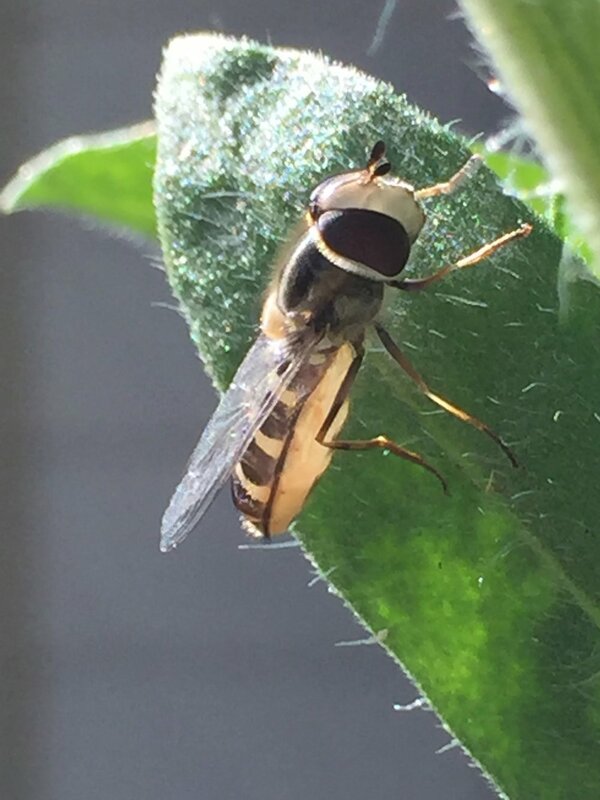 I'm so excited that there are Syrphid Flies in my garden because they are so beneficial! Syrphid Flies (of which there are many) mimic honeybees and wasps as a defensive camouflage; they do not sting, but want bigger predators to think they might. The adult flies are fabulous pollinators, eating both nectar and pollen. The larvae of some types are voracious predators of aphids, which is probably why I found this one in my garden. The eggs hatch and develop into larvae which eat a lot of aphids - in fact there are three larval instars (or phases) of some kinds of Syrphid Flies. I don't know about you, but I'm seeing way more aphids than I usually do, so anything that can help me control them is terrific! I'm hoping this fly laid lots of eggs on my aphid-ridden blanket flower. There are also Syrphid Flies that develop in stagnant ponds and eat decaying organic matter while in the larval instars. They form unique larvae called 'rat-tailed maggot.' The rat tail is a siphon that allows the larvae to breathe while in water. I first heard about this kind of hover fly from a professor in the UK that I like to follow - he has great books - and a great You Tube channel with lots of interesting pollinators. I'm not sure this kind of fly lives here, but I made his 'hover fly lagoon' anyway, to see what comes of it. It's quite easy - you just need a container filled with water and organic matter. I went begging my neighbor for some of his long, weedy grass to use in this lagoon, since Dr. Goulson says this is the best kind of organic matter to use. I'll let it fester (I put it a long way from the back door!) and see what grows there in a few months. Should be interesting. One thing I'll need to do is check the water level frequently and watch that it doesn't dry out. I'll keep you posted! Again, though, aphids will bring in the kind I took a picture of above. So you don't need to do anything except STOP USING PESTICIDES. Nature sends in predators when prey develops. And if you use pesticides (chemical or organic), you'll kill the good guys along with the bad. So far this year in my garden, the aphids have brought in: lady beetles, green lacewings, snakeflies, predatory mites, and syrphid flies. Plus probably others I haven't even noticed yet! Here is the video from Dr. Goulson about this project. His books are worth reading, as well, if you have interest in native bees.